The Licence tab include multiple fields which held product software details and license specifications. Software Title – The product title, can be different from the WooCommerce product main title. Software Unique ID – A unique ID which allow this product to be identified through API interactions. This need to stay unchanged once the product has been published. In case of modifications, the client updater need to reflect that. Software Version – Current product version. Licence Expire Units – The number of days/months/years to be set for expire parameter. Licence Expire Time – Type of interval to be used for expire units days/months/years. Software Author – Author details for current product. Software Page URL – A Url with the page of current product. WP Version Required – Minimum platform version which is required for the product to run. As default is refereed to WordPress but it can be another system. WP Version Tested Up To – Platform version up to which the product has been tested. Software Last Updated – The date of last update for the product. WP Update nottice – A short notice regarding update. Description – This include a page with the product description. FAQ – Frequent Answer Questions area. Screenshots – A page additional images of actual product. Changelog – A list with the changes of product during development process. Reviews – Details upon the reviews of the products. Other Notes – Additional notices which can’t be classified to other areas. Screenshots – A high / low resolution banner to be used for product presentation. Group Title – A group title which is also used on front side, within the user My Account. Should contain few words with description of licence i.e. Developer Licence, or Single Site Licence. Licence Prefix – Optional prefix which will append to generated licence keys, making those easy to be identified. Use Predefined Keys – This allow a list of predefined keys to be used instead generated ones. Predefined Keys – All predefined keys can be stored on that textarea, on a new key event call, a key will be extracted from the list. 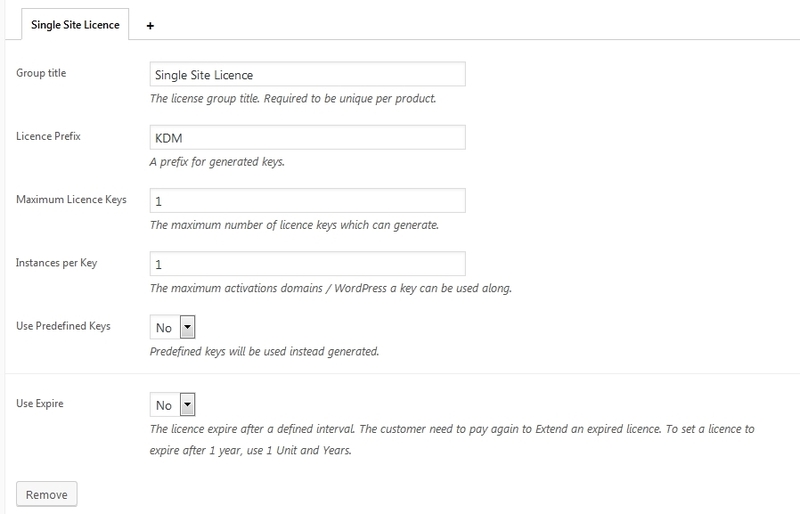 A product can contain multiple Licence Groups, using the Add License Group Type button more groups can be created for a product. Using this functionality, multiple licence types can be allowed for clients to generate i.e. a group with a developer licence to be used on multiple domains, another group with multiple keys to be used on single domain.